Thirty-year marine industry veteran John R. Hotz has accepted the position as the Assistant Director at the National Maritime Law Enforcement Academy (NMLEA), which together with its International Maritime Law Enforcement Academy (IMLEA) provides education, consulting services, resources and training for law enforcement officers, public safety professionals, military members, ports and waterside critical infrastructure personnel. Following a vision and leadership of Admiral Siler, a former U.S.
A table-top exercise on maritime security has been recently held in Kingston, Jamaica (30 June-1 July), organized by International Maritime Organization (IMO) in collaboration with the United Nations Regional Centre for Peace, Disarmament and Development in Latin America and the Caribbean (UNLIREC). The exercise was aimed at stimulating discussions and demonstrating the need for cooperation amongst government departments and agencies using a range of evolving scenarios related to maritime security and maritime law enforcement issues. The Coast Guard and Navy completed a 40-day joint mission in the Central and South Pacific under the Oceania Maritime Security Initiative to combat transnational crimes, enforce fisheries laws and enhance regional security Monday. A Coast Guard law enforcement detachment from Pacific Tactical Law Enforcement Team Detachment 108 embarked USS Spruance (DDG 111) and conducted 20 fisheries enforcement boardings with the assistance of the Navy's Visit, Board, Search and Seizure team and enforcement shipriders from the Federated States of Micronesia and Palau. U.S. Customs and Border Protection (CBP) Air and Marine Operations (AMO) and SAFE Boat International celebrated the unveiling of AMO’s newest coastal interceptor vessel (CIV) Thursday. In honor of AMO’s historical legacy, this first CIV will be named the Alexandria, after of one of the first maritime law enforcement “Collectorships” used by the Department of Treasury in 1789. AMO marine interdiction agents will operate the CIV in offshore coastal waters to combat maritime smuggling and protect U.S. ports from acts of terrorism. The International Maritime Organization (IMO) is leading a maritime security table-top exercise in Mombasa, Kenya (April 21-22) as part of the Organization’s continuing work to implement the Djibouti Code of Conduct. National officials from key ministries and departments are taking part in a range of evolving scenarios involving both routine business and during an incident, which aim to promote an integrated, whole-of-government approach to maritime security measures and maritime law enforcement. The crew of the USCGC Kiska (WPB 1336) returned to home port in Hilo last week after a particularly challenging living marine resources patrol due to weather. Despite encountering seas of more than 10-feet and 23 to 35 mph winds the crew carried out fisheries boardings and worked on crew qualifications while navigating approximately 1,450 total miles. Over 8 days they spent 126 hours enforcing fisheries laws by conducting two boardings approximately 300 miles from the Hawaiian Islands, ensuring the sustainability of fisheries in the Pacific. An international agreement that has been instrumental in repressing piracy and armed robbery against ships in the western Indian Ocean and the Gulf of Aden is set to significantly broaden its scope. Signatories to the Djibouti Code of Conduct have agreed to work toward extending its remit to address other illicit maritime activity that threatens safety and security in the region, such as marine terrorism, environmental crimes, human trafficking and Illegal, unreported and unregulated fishing. The need to regulate and police the maritime domain to tackle global threats is as pressing as ever, according to Phil Cable, CEO and cofounder of maritime security company MAST. “The global threats faced by the maritime environment, whether it be terrorist, pirate, illegal fishing, human trafficking or narcotics smuggling, stem from lack of law and order,” Cable stated, speaking at the Maritime Law Association of Australia and New Zealand (MLAANZ) Conference 2015 in Perth, Australia, Thursday. China has again deployed the Haiyang Shiyou 981, a semi-submersible oil platform which caused a standoff between Chinese and Vietnamese vessels last year, to the disputed South China Sea region, reports local media. China has brought the deepwater oil rig near Vietnam’s Hoang Sa (Paracel) Islands. The Chinese Maritime Safety Administration said on its website the oil rig is located at 17 degrees 03.75 minutes north latitude (17-03.75N) and 109 degrees 59.05 minutes east longitude (109-59.05E). U.S. Coast Guard and maritime law enforcement agencies on the Great Lakes and surrounding areas will partner up Friday through Sunday for the seventh annual Operation Dry Water campaign, a nationwide, multiagency effort focusing on boater education and raising awareness that it is unsafe, as well as illegal, to operate a boat under the influence of drugs or alcohol. 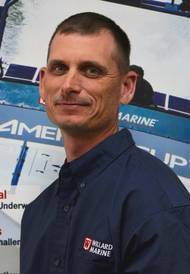 “Along with alcohol use, three of the other top five contributing factors in recreational boating deaths are operator inattention, improper lookout and inexperience of the operator,” said Mike Baron, the U.S.
Willard Marine, Inc. has hired Jimmy Sorenson as regional sales manager for the Gulf Coast and Florida. Sorenson served 11 years with the U.S. Coast Guard in many roles including machinery technician and maritime law enforcement instructor, and earned the boat coxswain certification. For the past 14 years, Sorenson managed business for an aluminum boat manufacturer, including proposal and quote development for a team of sales representatives. “Jimmy’s extensive experience with the U.S.
Gulf of Mexico fishermen are threatened by a daily wave of foreign illegal fishing vessels and the U.S. fishing industry is calling on Congress to take action, Florida business owners said April 8 at an event hosted by the Gulf Coast Leadership Conference. Mexican fishing boats enter U.S. sovereign waters and illegally poach hundreds to thousands of fish at a time. Although the U.S. Coast Guard and Gulf state maritime law enforcement agencies have taken aggressive action to find and destroy these illegal Mexican vessels, the frequency of such incursions continues to escalate. NATO Maritime Commander Vice Admiral Peter Hudson, CBE Royal Navy, visited the two-week Advanced Maritime Law Enforcement/Training of Trainers course taking place at NATO Maritime Interdiction Operational Training Centre (NMIOTC), in Souda Bay, Crete, Greece. The course is being conducted from February 23 to March 6 under the auspices of the Djibouti Code of Conduct (DCoC) and the Djibouti Regional Training Centre with the support and supervision of the IMO Secretariat’s Kiruja Micheni, and benefits from the high NATO standards embraced by NMIOTC. Coast Guard Cutter Tahoma returned Sunday to their homeport of Kittery, Maine after a 55-day patrol conducting operations and training in the Gulf of Maine and Georges Bank. The crew carried out Living Marine Resources boardings under the guidance of the 1st Coast Guard District. The Tahoma's law enforcement teams conducted boardings of commercial fishing vessels to inspect safety gear and enforce marine resource management to ensure sustainable fisheries in the North Atlantic. On Dec. 1, 2014 the Tahoma's crew assisted the disabled fishing vessel Madison Kate following an engine casualty. Coast Guard Cutter Hamilton, the first national security cutter homeported on the East Coast, entered into active service today at Union Pier Terminal in downtown Charleston. The commissioning ceremony for the Coast Guard’s largest and newest 418-foot cutter was presided by Vice Adm. William “Dean” Lee, Coast Guard Atlantic Area commander. Commandant of the Coast Guard, Adm. Paul F. Zukunft, delivered the keynote address. “Together with my shipmates, we’re beginning the most important milestones in the life of a cutter,” said Capt. Singer, actor and songwriter Kris Kristofferson attended his son Jesse Kristofferson’s U.S. Coast Guard (USCG) boot camp commencement ceremony today in Cape May, N.J., the USCG reported. In a photo released by the USCG, Kris hands Jesse a certificate during the graduation ceremony of Alpha-190 at U.S. Coast Guard Training Center Cape May, N.J. Kristofferson's son was one of 78 graduates to enter the Coast Guard enlisted workforce where they will be stationed all over the country performing duties ranging from maritime law enforcement to search and rescue.